In 2002, the Tom Cat was a brand new, first edition design from Tom Kuhn. It is a butterfly configuration designed by Tom Kuhn and manufactured by What's Next. It was the first butterfly aluminum yo-yo from Tom Kuhn, and, in 2002, it was the first new Tom Kuhn yo-yo in almost three years. Uses Dr. Yo's Turbo Discs and has an adjustable gap using the enclosed tool. Uses a size I ball bearing. 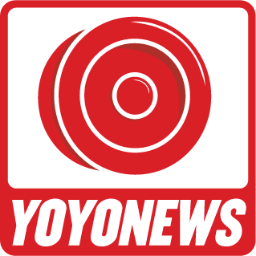 Pre-order sales for the yo-yo began in May 2001 but actual delivery took place in February 2002. Supposedly, this model was limited to 500 pieces. The first serial number--000--went to Brad Countryman (owner of What's Next Mfg., Inc.); serial numbers 001-003 went to Tom Kuhn. Original retail price: $125 US. See the original announcement postcard for the Cat series. 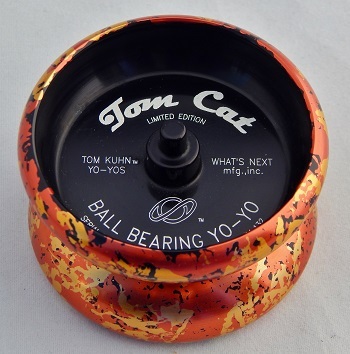 Of interest, the back of the card mentioned three different "Cat" yo-yo releases that were only available by pre-order: First, the Tom Cat; second, the Fat Cat; and third, the Cool Cat. The first two models were released. However, the Cool Cat was never released... or was it?! See also the Tom Kuhn Black Cat.